Marlene Alraune, Jean-Paul DuChamp, and Marc Spector (aka Moon Knight) were infiltrators as Mary Sands, Francois Valjean, and Yitzak Topol, respectively. (Moon Knight I#17 (fb) - BTS) - Having served in Black September, the Red Army, Black Hand, and numerous other terrorist groups, Nimrod Strange formed the Third World Army, a coalition of extreme leftist and rightest terrorists. Privately disavowing all political affiliations, they publicly played both ends against the middle, accepting aid and weapons from communists and right-wing dictators alike. Their goal was to bring the world, both East and West, to its knees; while the world powers scoffed at them, they exploited their amused neglect to build themselves into a position of strength. (Moon Knight I#17 (fb) - BTS) - Strange constantly surrounded himself by a trio of beautiful but deadly -- highly trained in the art of terror -- female bodyguards: "One black, one white, and one Asian, symbolizing his coalition of the three major factions of his Third World <Army>." The women were periodically replaced by successors, who either surpassed a predecessor or replaced one incapacitated or slain. (Moon Knight I#17 (fb) - BTS) - Strange employed a personal cadre of terrorist assassins, the Slayers Elite, who did anything he asked of them. (Moon Knight I#17 (fb) - BTS) - Strange's right-hand man was the Master Sniper, who struck like a ghost and disappeared similarly. (Moon Knight I#18 (fb) - BTS / Moon Knight I#19 (fb) - BTS) - Strange prepared his Third World Army to strike in a coordinated series of more than two dozen simultaneous major assaults worldwide (including Tokyo, Lebanon, Poland, Paris, Madrid, Rome, Buenos Aires, South America). This was intended to launch the beginnings of the ultimate chaos that would bring the world's governments to their knees. (Moon Knight I#20 (fb) - BTS) - Chief amongst Strange's plans was a plot to hold hostage the entire island of Manhattan, New York, based on a situation designed by the US anti-terror task force to prepare anti-terrorist responses in the event such a situation ever came to pass. The plot entailed destroying the city after blocking the four major access points to the city: The Holland and Lincoln Tunnels and the Brooklyn and George Washington Bridges. The plan was to hijack four oil tankers and anchor them by the four access points, after which all four tankers would begin purging their oil; gases would build as the oil levels dropped, until a critical point was reached, and the tankers would explode, destroying the access points. The purged oil would then ignite and spread to the piers, docks, and land waiting beyond. The fires would spread quickly, destroying the other smaller bridges off the island, and the entire island would be surrounded by flame and everyone within would eventually die from the inwardly burning fire, like panicked rats; casualties were estimated to approach 97%. How Strange learned of this plan is unrevealed. (Moon Knight I#17 (fb) - BTS) - Israeli agent Benjamin Abramov learned that Nimrod Strange's organization was prepared to attack US soil and several other locations simultaneously; as the CIA (and the British, French, and German governments) still did not believe Strange or his army a legitimate threat, Abramov decided to seek aid from his old ally Marc Spector. (Moon Knight I#17 - BTS) - Abramov warned Spector of Nimrod Strange and his armies, asking him to deliver a coded message to a man named Strelgov, in Lausanne, Switzerland. However, the Master Sniper then struck, shooting Abramov. Dying, Abramov referenced his third rib over his heart before perishing. 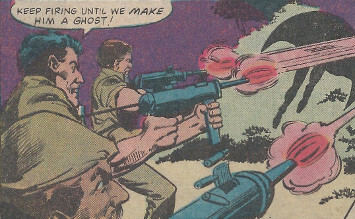 The Sniper shot Spector when he pursued as Moon Knight, but the Sniper fled Spector's approaching allies, Marlene Alraune and Jean-Paul "Frenchie" DuChamp, uncertain of their number, etc. (Moon Knight I#17) <1 week later> - As Strange watched as his body guards challenged each other in combat, he was briefly distracted by an aide (Chu-Lin?) who noted the arrival of new recruits; calling the aide a fool, Strange ordered him to begin their indoctrination and to not bother him there again. (Moon Knight I#17 - BTS) <2 weeks later> - Marlene revealed that a false mole over Abramov's left third rib had concealed a microdot, which contained the coded message. Ten hours later, Spector and Marlene arrived via plane in Switzerland, where Spector tracked down and met with Strelgov. After the Master Sniper apparently perished battling Moon Knight, Spector gave the microdot slides to Strelgov, who hoped the dot would reveal the location of Strange's training base. (Moon Knight I#18 (fb) - BTS) - Strange summoned his Slayers Elite (Jou-Jouka, Kareesh-Bek, Sumaro) for discussion of a mission to Jerusalem to locate and eliminate Marc Spector. (Moon Knight I#18) - In his palatial "command center," Nimrod Strange watched his bodyguards battle, before summoning his Slayers Elite and briefing both groups on the Slayers' mission and the importance that the Third World Army's planned simultaneous attacks were not jeopardized by Spector or anyone else, Strange then reviewed the planned attack on Jerusalem, which might draw out Spector for them. (Moon Knight I#18 - BTS) - Members of the Third World Army slaughtered those gathering at synagogue to celebrate the Sabbath. As Moon Knight and DuChamp defeated the Army members, the Slayers Elite kidnapped Marlene and Abramov's widow, Anna, but Moon Knight rescued them, apparently killing the Slayers Elitein succession in the process. The next day, as Strelgov's forces had decoded the microdot, learning Strange's base's location and begun preparing an assault, Spector happily agreed to join them. (Moon Knight I#20 (fb) - BTS) - In preparation for the Manhattan assault, Strange sent a number of his Third World Army agents off of his island base and stationed them in Manhattan. 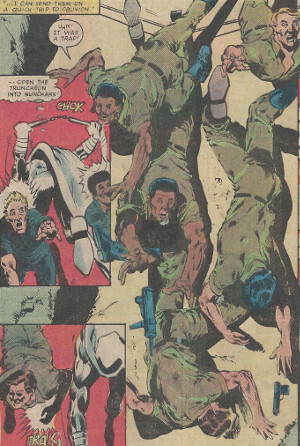 (Moon Knight I#19) - At a remote airstrip in Lebanon, soldiers of the Third World Army loaded new terrorist recruits into the back of a truck, instructing them that they would board the plane directly from the truck so no one would see them. They were interrupted by Moon Knight, who glided into their midst, avoiding their gunfire and striking at least one of them before swooping into the woods, leading some of them to pursue him. Using his truncheon's grappling hook, he secured a trip wire around a tree across a path, dropping the onrushing soldiers, and then recovering his truncheon and battering them with it in nunchaks mode. (Moon Knight I#19 (fb) - BTS) - Meanwhile, one of the guards (Chu-Lin?) spotted Marlene, who had been hiding in the shadows, but stepped out to look for Spector/Moon Knight. (Moon Knight I#19) - Returning to the truck, Moon Knight distracted the only guard still present with a thrown crescent dart before punching him out. (Moon Knight I#19 - BTS) - Knowing he had only knocked out a few of the guards and that the others would soon be returning, he dragged the most recently dropped guard as he located the hiding Frenchie and Marlene and changed into his costume as Yitzak Topol; when Marlene tried to warn him about the guard seeing her, he cut her off due to their time crunch. (Moon Knight I#19) - Spector, DuChamp, and Marlene infiltrated the Third World Army's recruits as Yitzak Topol, Francois Valjean, and Mary Sands, respectively; once they were in the truck, Marlene was able to tell Spector she had been spotted. Shortly thereafter, the guard who had spotted Marlene showed up and told the others what they had seen. Asking where was Rashid -- who was not supposed to have left the truck for any reason (he may have been the final one Moon Knight stopped) -- he then chastised the others as delusional. When the truck failed to start, the head guard ordered everyone to get out of the truck and walk to the plane. Just before the three infiltrators would have gotten out (and Marlene would have been identified by the head guard), the truck started, and everyone got back in the truck and drove to the plane (which wasn't very far at all). As the new recruits (and infiltrators) boarded the plane, the head/angry guard (or another guard; this one was similar, but with a moustache, whereas the one berating the driver did not have a moustache) stopped Topol (Spector) and asked his name; Topol showed his credentials, and though the guard angrily noted not remembering his face, he allowed him aboard as his credentials were in order. 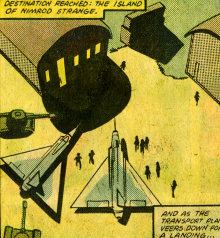 The plane soon flew the soldiers, new recruits, and infiltrators to Strange's island base. (Moon Knight I#19) - Pleased to see the new recruits' approaching plane, Nimrod Strange invited his bodyguards to join him as he review them. After reviewing the Third World Army's purpose, he questioned the names and histories of the new recruits, including Francois Valjean and Mary Sands. Strange took an interest in "Mary," noting she had the requirements to be one of his bodyguards. When Strange ordered Chu-Lin to train her in the rest (of the requirements), "Mary" insisted she had already been trained, and Strange instructed Yumi to test her and show her the type of training required of her. When "Mary" defeated Yumi, Strange acknowledged that she had passed the test and then replaced Sheena (who he had repeatedly noted as being too slow) with "Mary"; he told Sheena she was dismissed from his personal service, but could join the others to be outfitted for uniforms; he then took "Mary" to show her her new uniform and to prepare her for the night's initiation. (Moon Knight I#19 - BTS) - Investigating further, Sheena confirmed that there were three extra recruits, and no Mary or any other woman in the manifest. (Moon Knight I#19) - Later, at the compound behind Strange's personal barracks, Strange noted to his bodyguards (including "Mary") that with the recent loss of both the Master Sniper and the Slayers Elite, that they needed someone colorful and inspirational to take their place. Donning the weaponry of the Master Sniper, Jou-Jouka, Kareesh-Bek, Sumaro, and Chu-Lin (nunchaks) as part of his new costume, he introduced himself as Arsenal and ran a gauntlet to demonstrate his proficiency and power. Arsenal subsequently excused himself to meet with his lieutenants. One of his lieutenants, perhaps Chu-Lin (completely in shadows), noted that the training of the new recruits would be completed in two weeks, after which the world would sit up and take notice of the Third World Army via their simultaneous raids on multiple targets; but Strange interrupted, telling him to not be so eager for recognition, as their success thus far was due only to the fact that the world had refused to take them seriously -- only the Israeli Mossad (as well as "the two Americans, Marc Spector and Moon Knight") considered them a true threat. He further announced that with the USA reeling in shock over the previously noted attacks, they would be too stunned to deal with their main hit, the blackmailing of the USA via taking Manhattan hostage. (Moon Knight I#19) - That night, as Moon Knight and DuChamp sabotaged most of the Third World Army's weapons and planes, Strange prepared to "initiate" "Mary." (Moon Knight I#19 - BTS) - Sheena informed Chu-Lin of two infiltrators in the new recruits; after confirming the empty bunks at the barracks, Chu-Lin awakened the rest of the Army, while Sheena entered Strange's barracks, intending to deal with "Mary" herself. With the Army's weapons neutralized, Moon Knight and DuChamp took out Strange's soldiers out easily. However, subsequently hearing the explosions of their planes, Strange realized something was amiss, just as Chu-Lin arrived and informed Strange what was going on. Strange instructed him to gather the other bodyguards, and they would use the hidden motor-launch to leave the island at once; Strange, meanwhile, donned his Arsenal costume and went to confront his attackers. (Moon Knight I#19 - BTS) - As Moon Knight crashed Strange's last plane into the Army's weapons depot, sending off a massive explosion, Strelgov and his allies, including Eban, took that as their signal, and they guided their ship towards the island. (Moon Knight I#19) - After directing "Mary" to the motor-launch -- fearing ruining their planning, Marlene continued to play along -- Arsenal was confronted by Moon Knight. After Moon Knight explained the reasons for his desire for revenge, Arsenal chided him for wasting the element of surprise and opened fire. However, when Arsenal's grenade, deflected off-course by a crescent dart, exploded close enough to Moon Knight to leave him seemingly dead amongst shattered wreckage, "Mary" departed with Arsenal after seeming Moon Knight's hand move and realizing he was still alive. (Moon Knight I#19 - BTS) - By the time Moon Knight recovered, Strange, "Mary," Assigi, and Yumi were long gone. Finding a piece of Nimrod's shattered giant globe, Spector told Stelgov of Strange's plans to destroy the bridges and tunnels out of Manhattan. Streglov and Eban's men captured the Third World Army members present on the island. (Moon Knight I#20 (fb) - BTS) - Receiving Strange's signal, the Third World Army agents stationed in Manhattan initiated the plan, hijacking the four oil tankers and anchoring them by the Holland and Lincoln Tunnels and the Brooklyn and George Washington Bridges. (Moon Knight I#20 (fb) - BTS) - Strange and his allies met up with his Army members, occupying the tanker under the George Washington Bridge, controlling his men aboard the other three tankers via "radio-phone" (a topical reference?). Not interested in insignificant hostages, Strange had all four crews released. (Moon Knight I#20 - BTS) - Moon Knight approached the tanker via scuba gear just as Strange's men began purging the oil into the water. Scaling above the oil line, Moon Knight burnt a hole into the hull to release the built up gas before it could reach the point of explosion. Streglov and Eban met with the anti-terrorist command post staff in Lower Manhattan led by Mr. Brent, detailing Strange and his allies' ongoing threat. Streglov revealed the presence of his ally aboard Arsenal's tanker, acknowledging that he would be expelled from the Mossad and perhaps even Israel herself should his plan fail. (Moon Knight I#20) - Moon Knight continued to infiltrate the tanker, working his way through the Third World Army soldiers on the ship, but one man recovered quickly enough to warn Arsenal that Moon Knight was aboard the ship. When Moon Knight burst into the room, Arsenal commanded "Mary" to stop him. Both "Mary" and Moon Knight hesitated, allowing Assigi and Yumi to strike unseen from other side with powerful kicks to the head that knocked Moon Knight unconscious. Rather than execute his enemy, Arsenal tied Moon Knight over the ship's generator, took his truncheon, and mocked and unmasked him; pleased at having captured the man who was both of his nemeses, Strange left him there. Moon Knight popped off his crescent darts on the generator's rivets and eventually caught one in his hand and began cutting through the ropes binding him; meanwhile, Mr. Brent received a message from the President of the United States, that Moon Knight had 15 minutes to succeed or an anti-terror commando squad would strike. When Strange, Assigi, and Yumi dozed off, Marlene tried to sneak away and free Moon Knight. Assigi awakened and questioned "Mary"; not believing her excuse of going to get some fresh air, Assigi awakened Arsenal. (Moon Knight I#20 - BTS) - Arsenal readied himself for an assault on his cabin. (Moon Knight I#20) - Marlene reunited with the already-free Moon Knight, and took out the crew together, but when they entered Strange's cabin in hopes of finishing him off, they narrowly dodged a shotgun blast from Arsenal. Strange sent Yumi and Assigi after his foes as he rushed to reach the detonator in the forward hatch. Marlene took both women on and eventually defeated them, while Moon Knight pursued Arsenal, eventually narrowly defeating him. After tying up Arsenal and ripping the wires from the detonator, Moon Knight departed with Marlene, met up with DuChamp, and departed in the Mooncopter. (Moon Knight I#20 - BTS) - Mr. Brent's forces retook the other three tankers. (Moon Knight I#20) - Reviving, the unsupervised Strange, sat up, reconnected the wires to the detonator, and pushed the plunger with his head. Though the gas had already been vented, everyone aboard Arsenal's tanker (just he and other members of the Third World Army apparently, presumably including Assigi and Yumi) were instantly killed. The George Washington Bridge was undamaged, and the oil fires on the water burned themselves out harmlessly. Comments: Created by Doug Moench, Bill Sienkiewicz, and Steve Mitchell. In Moon Knight I#17, Strange's army was consistently referred to as the "Third World Slayers." In #18-20, they were consistently referred to as the "Third World Army." While the general policy is to follow the precedent, it seems to me that since the writer (Doug Moench) was consistent throughout the whole arc, the latter name was a correction of an earlier error...perhaps confusing the names of his "Slayers Elite" and the "Third World Army," or perhaps Third World Army and Third World Slayers are two names for the same group? Chu-Lin seemed to act as Nimrod Strange's aide and reported directly to him. He also was in charge of training at least the bodyguards, and possibly trained new recruits and/or participated in missions to pick up new recruits. (Moon Knight I#17) <1 week later> - In his palatial "command center," as Nimrod Strange watched as his body guards challenged each other in combat, he was briefly distracted by an aide (Chu-Lin?) who noted the arrival of new recruits; calling the aide a fool, Strange ordered him to begin their indoctrination and to not bother him there again. (Moon Knight I#18) - In his palatial "command center," Nimrod Strange ordered his aide (Chu-Lin?) to show in the Slayers Elite. (Moon Knight I#19 - BTS) - At a remote airstrip in Lebanon, soldiers of the Third World Army loaded new terrorist recruits into the back of a truck. Moon Knight distracted and led away the guards. (Moon Knight I#19) - Shortly thereafter, the guard who had spotted Marlene showed up and told the others what they had seen. Asking where was Rashid -- who was not supposed to have left the truck for any reason (he may have been the final one Moon Knight stopped) -- he then chastised the others as delusional. When the truck failed to start, this same guard ordered everyone to get out of the truck and walk to the plane. Just before the three infiltrators would have gotten out (and Marlene would have been identified by the head guard), the truck started, and everyone got back in the truck and drove to the plane (which wasn't very far at all). As the new recruits (and infiltrators) boarded the plane, the head/angry guard (or another guard; this one was similar, but with a moustache, whereas the one berating the driver did not have a moustache) stopped Topol (Spector's alias) and asked his name; Topol showed his credentials, and though the guard angrily noted not remembering his face, he allowed him aboard as his credentials were in order. The plane soon flew the soldiers, new recruits, and infiltrators to Strange's island base. (Moon Knight I#19) - The new recruits arrived on Strange's island and were reviewed by him. Strange took an interest in "Mary Sands" (the alias of Spector's lover and ally, Marlene Alraune) and ordered Chu-Lin to train her in the rest of the requirements of his bodyguards. "Mary" instead proved herself by defeating the bodyguard Yumi, and Strange accepted "Mary" as the replacement for Sheena, who had been performing more poorly recently. (Moon Knight I#19) - Later, at the compound behind Strange's personal barracks, Strange noted to his bodyguards (including "Mary") that with the recent loss of both the Master Sniper and the Slayers Elite, that they needed someone colorful and inspirational to take their place. Donning the weaponry of the Master Sniper, Jou-Jouka, Kareesh-Bek, Sumaro, and Chu-Lin (nunchaks) as part of his new costume, he introduced himself as Arsenal and -- after instructinting Chu-Lin to prepare the targets -- ran a gauntlet to demonstrate his proficiency and power. Arsenal subsequently excused himself to meet with his lieutenants. One of his lieutenants, possibly Chu-Lin (completely in shadows; there were four people beyond Strange), noted that the training of the new recruits would be completed in two weeks, after which the world would sit up and take notice of the Third World Army via their simultaneous raids on multiple targets; but Strange interrupted, telling him to not be so eager for recognition, as their success thus far was due only to the fact that the world had refused to take them seriously -- only the Israeli Mossad (as well as "the two Americans, Marc Spector and Moon Knight") considered them a true threat. He further announced that with the USA reeling in shock over the previously noted attacks, they would be too stunned to deal with their main hit, the blackmailing of the USA via taking Manhattan hostage. (Moon Knight I#19) - Having researched the manifest list of recuits, Sheena informed Chu-Lin of two infiltrators in the new recruits (keeping to herself that "Mary" was the third infiltrator); after confirming the empty bunks at the barracks, Chu-Lin awakened the rest of the Army, while Sheena entered Strange's barracks, intending to deal with "Mary" herself (she was instead knocked out by "Mary"). With the Army's weapons neutralized, Moon Knight and DuChamp took out Strange's soldiers out easily. (Moon Knight I#19) - Hearing the explosions of their planes, Strange realized something was amiss, just as Chu-Lin arrived and informed Strange what was going on. Strange instructed Chu-Lin to gather the other bodyguards, and they would use the hidden motor-launch to leave the island at once; Strange, meanwhile, donned his Arsenal costume and went to confront his attackers. (Moon Knight I#19 - BTS) - Strange, "Mary," Assigi, Yumi escaped the island before Strelgov, Eban, and the elite Mossad agents arrived and captured the weaponless terrorists. Finding a piece of Nimrod's shattered giant globe, Spector told Stelgov of Strange's plans to destroy the bridges and tunnels out of Manhattan. It is unrevealed whether Chu-Lin escaped the island with the bodyguards or was captured or killed in the struggle between Moon Knight and his allies vs. Strange's forces. 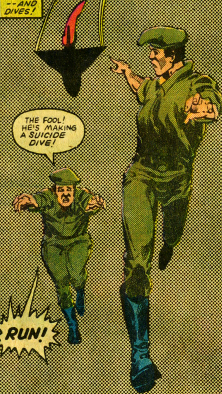 Comments: Chu-Lin was one of only two identified soldiers in the Third World Army (not counting the bodyguards, Slayers Elite, or Master Sniper); the other was Rashid, and he wasn't clearly shown on panel, although I suspect he was the guy Moon Knight distracted with the crescent dart and then knocked out). The guy in #17 communicating directly to Strange not identified. He was black/African and wore the typical soldier uniform with beret. He did not seem to have facial hair, but he was only seen from a distance. The guy in #18 filling that role was not identified. He was black/African and wore the typical soldier uniform with beret. He did not have facial hair. In #19, the soldier that spotted Marlene was not identified. He was black/African and wore the typical soldier uniform with beret. He did not have facial hair. In #19, the soldier that inspected Topol/Spector 's credentials as not identified. He was black/African and wore the typical soldier uniform with beret. He had a moustache. Spector's thought, "He spotted Marlene--our cover's blown!" makes me think it was the same guy who had seen Marlene before. 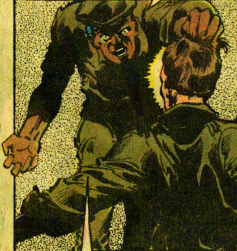 In #19, when Strange tells Chu-Lin (identified) to train "Mary Sands" (Marlene Alraune), Chu-Lin was black/African and wore the typical soldier uniform with beret. He had a moustache; while you couldn't fully see his chin, he did not seem to have other facial hair. In #19, when Sheena tells Chu-Lin (identified) that there are two infiltrators amongst the new recruits and he checks the barracks, Chu-Lin was black/African and wore the typical soldier uniform with beret. He had a moustache and a beard connecting to the moustache and apparently running the whole way up to his hairline. 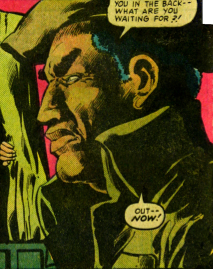 In #19, when Strange tells Chu-Lin to prepare the targets, Chu-Lin's face is only partially seen in profile, but it looks to me as if he has a mustache and at least a goatee, but it also seems the goatee may continue on to a full beard. In #19, when Chu-Lin (identified) tells Nimrod Strange that infiltrators had destroyed three of their planes, Chu-Lin was black/African (he seemed significantly lighter in complexion, but it was a single shot and his face was distant and partially covered) and wore the typical soldier uniform with beret. He appeared to have a moustache, but no other facial hair was apparent. In #20 Chu-Lin is not identified nor obviously seen. It is unclear whether he escaped Strange's island, though as his job was to get the other bodyguards off, and they made it off safely, it would seem likely he escaped, too...or, maybe he went back to fight off the invaders/attackers after getting the girls to safety; but, we'll probably never know. The location of the island base of Nimrod Strange's Third World Army is unrevealed. It contained a paramilitary-type compound with barracks. There were at least three fighter jets (and at least a landing strip), a couple tanks, a weapons depot, a motorboat launch dock (with an unrevealed number of boats), as well as Strange's palatial command center. (Moon Knight I#17) - From within his palatial command center, as Strange watched as his body guards challenged each other in combat, an aide (Chu-Lin?) noted the arrival of new recruits. 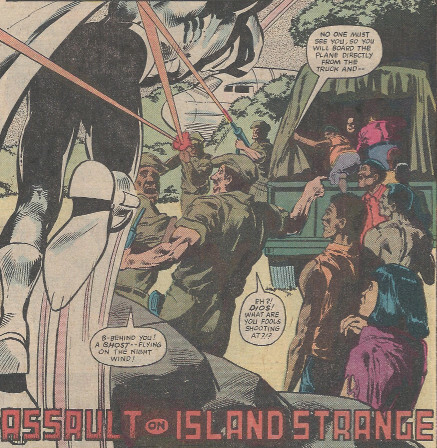 (Moon Knight I#19 - BTS) - Strange's soldiers flew a number of new recruits from Lebanon by plane to Strange's island base. (Moon Knight I#19) - As the plane arrived, Strange and his bodyguards reviewed the new recruits, and Strange replaced his Caucasian bodyguard, Sheena, with new recruit "Mary Sands" (an alias of Moon Knight's lover and ally, Marlene Alraune). (Moon Knight I#19) - That night, Moon Knight and DuChamp sabotaged most of the Third World Army's weapons and planes. Sheena, who had discovered that Mary and her two allies were infiltrators, informed Chu-Lin of the two male infiltrators. While Chu-Lin confirmed this and awakened the other soldiers, Sheena tried to confront and expose "Mary," only to be incapacitated by her instead. With the Army's weapons neutralized, Moon Knight and DuChamp took out Strange's soldiers out easily. Hearing the explosions of their planes, Strange realized something was amiss, just as Chu-Lin arrived and informed Strange what was going on. Strange instructed him to gather the other bodyguards, and they would use the hidden motor-launch to leave the island at once; Strange, meanwhile, donned his Arsenal costume and went to confront his attackers. (Moon Knight I#19 - BTS) - As Moon Knight crashed Strange's last plane into the Army's weapons depot, sending off a massive explosion, Israeli anti-terrorist Strelgov and his allies, including Eban, took that as their signal, and they guided their ship towards the island. (Moon Knight I#19) - After directing "Mary" to the motor-launch -- fearing ruining their planning, Marlene continued to play along -- Arsenal incapacitated Moon Knight. "Mary" departed with Arsenal after seeming Moon Knight's hand move and realizing he was still alive. (Moon Knight I#18) - In his palatial command center, Nimrod Strange watched his bodyguards battle, before summoning his Slayers Elite and briefing both groups on the Slayers' mission and the importance that the Third World Army's planned simultaneous attacks were not jeopardized by Spector or anyone else, Strange then reviewed the planned attack on Jerusalem, which might draw out Spector for them. (Moon Knight I#19) - Later, at the compound behind Strange's personal barracks (Not sure if this was part of the "palatial command center or not), Strange revealed to his bodyguards his new identity as Arsenal and ran a gauntlet to demonstrate his proficiency and power. Arsenal subsequently excused himself to meet with his lieutenants. One of his lieutenants, perhaps Chu-Lin (completely in shadows), noted that the training of the new recruits would be completed in two weeks, after which the Third World Army would shock the world via their simultaneous raids on multiple targets; Strange further announced that with the USA reeling in shock over the previously noted attacks, they would be too stunned to deal with their main hit, the blackmailing of the USA via taking Manhattan hostage. (Moon Knight I#19) - That night, as Moon Knight and DuChamp sabotaged most of the Third World Army's weapons and planes, Strange prepared to "initiate" "Mary." Having discovered the infiltrators amongst the new recruits and told Chu-Lin of the two male infiltrators, Sheena entered Strange's barracks, intending to deal with "Mary" herself. Irritated by the knock on his door, interrupting his intended romance, Strange sent "Mary" to deal with it, allowing Marlene to incapacitate Sheena before she could voice her concerns. (Moon Knight I#20 (fb) - BTS) - The plan was to hold hostage the entire city of Manhattan, New York, based on a situation designed by the US anti-terror task force to prepare anti-terrorist responses in the event such a situation ever came to pass. The plan was to have the four tankers begin purging their oil; gases would build as the oil levels dropped, until a critical point was reached, and the tankers would explode, destroying the access points. The purged oil would then ignite and spread to the piers, docks, and land waiting beyond. The fires would spread quickly, destroying the other smaller bridges off the island, and the entire island would be surrounded by flame and everyone within would eventually die from the inwardly burning fire, like panicked rats; casualties were estimated to approach 97%. (Moon Knight I#20) - Moon Knight continued to infiltrate the tanker, working his way through the Third World Army soldiers on the ship, but one man recovered quickly enough to warn Arsenal that Moon Knight was aboard the ship. Arsenal and his bodyguards initially captured Moon Knight, but eventually he and Marlene Alraune defeated the terrorists. After tying up Arsenal and ripping the wires from the detonator, Moon Knight departed with Marlene, met up with DuChamp, and departed in the Mooncopter.